January 29 was a revelatory day for architecture in Texas. That morning, the Linda Pace Foundation opened the doors of its new gallery to the press for a tour led by its architect, Sir David Adjaye (Alamo Architects, the locals on the job, were also along for the ride). Later that evening, Adjaye gave a lecture at Trinity University that was followed by a cocktail reception back at Ruby City, the gallery’s poetic name. As architects go, Adjaye — a Ghanaian born in Tanzania who lives and works in London — is kind of a big deal. In the past few years, he wrapped up work on the Smithsonian National Museum of African American History and Culture in Washington, D.C.; became the 10th winner of the London Design Medal; was knighted by Queen Elizabeth II of the United Kingdom; and was listed as one of Time Magazine’s top 100 influential people (the only architect on the list in 2017). So it stands to reason that any project with Adjaye’s name on it will attract a good deal of attention and invoke a variety of responses from the community in which the project exists. For example, during the press tour, I bumped into San Antonio Mayor Ron Nirenberg, who said of the building, “It’s a game-changer for the city.” This bit of ambiguous political rhetoric opened the question: What game, exactly, will it change, and how? How much can a 14,000-sf gallery for contemporary art — a jewel dropped by an heiress — really alter the character of a metropolis? Nirenberg’s comment was further challenged by a local whom I spoke with later that night, who did not think many San Antonians would visit or care about the space, which, she asserted, would only be made use of by the art elite and highfalutin tourists. Similarly dampening perspectives were offered by some of the architects I encountered that day. One of them, who rode down in a bus chartered by AIA Austin, quipped after Adjaye’s talk, “I hope it looks better in person!” I assured him it did, while ruminating on just how petty architects (not to mention other creatives) can be about their colleagues’ work, especially the work of colleagues with accolades. But perhaps the most flattening commentary I heard came from UTSA architecture professor Antonio Petrov, who, when asked his opinion of the project, shrugged his shoulders and said, “It’s good for San Antonio,” suggesting that if it were in a town with a more robust contemporary design culture it would not make much of a ripple. So what of the building? I can’t publish a photo here, due to a press embargo (look for full coverage of the project in the July/August 2019 edition of Texas Architect). 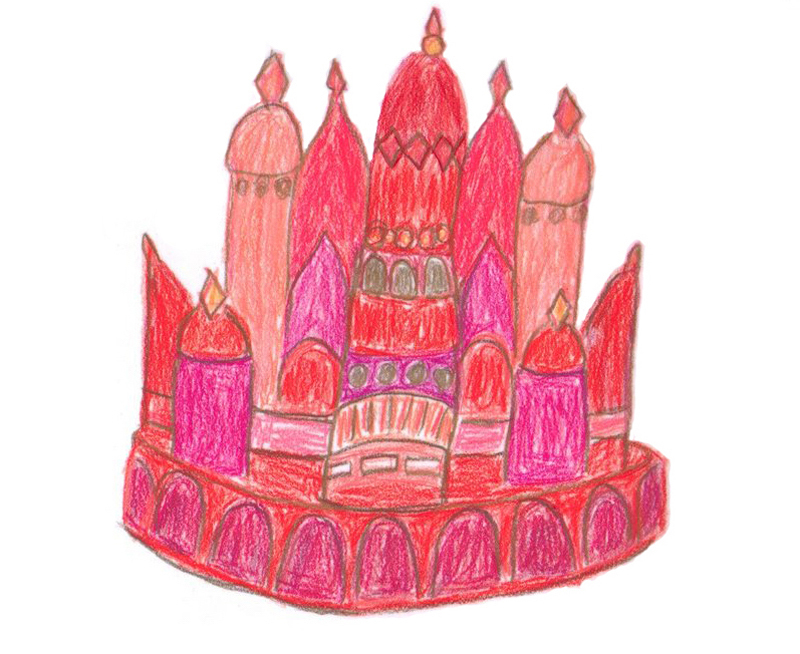 However, the Linda Pace Foundation has allowed me to run the drawing that Pace did to inspire her architect, an image that came to her in a dream, of a shining city on a hill, with spires and domes, all rendered in varying shades of red. Adjaye showed several regional precedent images during his lecture — some obvious (the missions); others more puzzling (Mesa Verde) — but Pace’s drawing seems the most operative, and not just because the building is varying shades of red. Ruby City feels like a dream, a vision projected on the San Antonio cityscape by client and architect: It sparkles in the sun. It cuts different profiles as your perspective changes. It curates views of things personal to Pace: the park she designed for her dead son, a looming Nancy Rubins sculpture of jumbled airplane parts and tie-wire. Whether Ruby City is a game-changer, or just good for San Antonio, remains to be seen (it won’t open to the public until the fall, making this a very early press unveiling). It will be interesting to follow what is said about the project, for things that stick out are often hammered back into the fold, and what is said usually reveals as much, if not more, about the speaker as it does about the object of their discourse. For this dreamer, it is a success, a real game-changer that’s good for San Antonio.